Mose Hole earned three letters each in basketball and football from 1914-1918. At The College of Wooster, he served as Athletic Director for 19 years, but was better known as its basketball coach. He was an innovator, combining a zone press with a run-and-gun offense which smothered opponents with an avalanche of points. 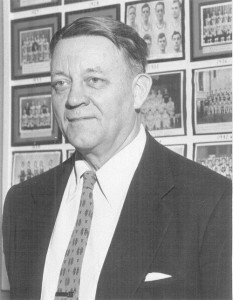 During 32 seasons at the Scot helm, he compiled a record of 412-181 while winning five Ohio Conference Championships.